This book aims to provide readers new insights into leadership during a period which is generally acknowledged to be one of unprecedented and rapid change. It challenges the established wisdom of both creating and adapting to change relying mainly on intellect, data and individualism, while at the same time subjugating our emotions, to drive performance-oriented businesses. Jude Jennison argues that this predominantly Western business culture is imbalanced and is contributing to a world in which people feel less in control of their lives and disconnected. Which in turn leads to high levels of stress, unengaged employees, underperforming businesses and poor quality leaders. Using a story-telling narrative of Jennison’s own corporate experiences as a high performing senior leader within IBM, and drawing on her current career as leadership development specialist and executive coach, she covers a lot of ground. 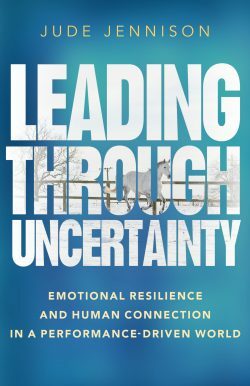 The first part of the book provides the context for her book, the second part addresses the emotional challenges of uncertainty and the third part covers how work can be humanised. Throughout, she challenges the reader’s current perceptions, attitudes and beliefs, and at the end of each of the book’s 14 chapters she offers not only concise summary statements of what she’s covered in each but also a set of questions which invite the reader to reflect and create their own agenda for personal change. A lot of Jennison’s current practice uses horses to create environments in which her clients can face up to their own attitudes and beliefs about dealing with the unknown; in other words, the horses are a key part of the apparatus of her laboratory in which people are tasked with leading animals. Now, I will be the first to admit scepticism of this approach to leadership development and found myself continually forcing myself to keep an open mind. In fairness to Jennison, she’s not preaching that this is the way to develop leaders, just that it’s been effective for her and now for her clients. Jennison includes a number of case studies of clients’ testimonies to the transformative experiences of working with horses. These make it much easier to accept this as a method of giving people embodied experiences of leadership by increasing their self-awareness to the extent that they are better able to both recognise and deal with their own inner divisions, limiting beliefs and unhelpful leadership behaviours. In turn, they become better equipped to develop their leadership presence and greater behavioural ability under pressure or in the face of uncertainty. It’s very convincing. In addition, Jennison reflects in her narrative what she advocates as more powerful and effective leadership behaviours, these being based on trust, curiosity, compassion and courage. She leaves it to the reader to agree with her arguments or not. Her style is straightforward, uncomplicated, gentle yet assertive. She generously shares her insights; whether these are new is for the reader to determine, but they certainly invite personal reflection. In addition, her book adds weight to the argument for a different approach to leadership development based on embodied experience.